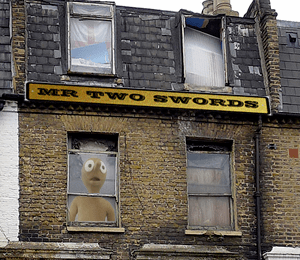 Conveniently located just off the road just off the road just off the high street, and round the back of the disused garages, Mr Two Swords is Harold’s newest tourist attraction and promises visitors “an experience that might even leave unborn children feeling a little unsettled”. But can an establishment displaying Plasticine models of celebrities really live up to that claim? Well, yes, in a word. My first impression of Mr Two Swords was that it was free admission, however I later learned that there is a £15 fee if you want to leave. Set in the back room of a damp, rundown and dimly lit terraced house, after about ten minutes you may well feel that this is a bargain. As well as being struck by a generally unpleasant smell you are likely to be a little uncomfortable when you notice that the proprietor is just standing in the corner, staring at you. But what about the stars of the show; the “celebrities” themselves? I didn’t like them, not one bit. They made me feel uncomfortable, the models didn’t look right. And I’m sure I saw one of them move. As far as the likenesses go, without the name badges I would have struggled to guess who any of them were supposed to be. The breasts are incredibly realistic, especially on the one labelled “James Corden”, but the rest is amateurish at best. After fifteen minutes I had done my journalistic duty, seen models of celebrities ranging from Hitler to Justin Bieber, attempted to make small talk with a proprietor who just grunted at me and I was ready to head home, lock the doors and have a bath. On my way out he muttered something about a private booth being available if I wanted to “get to know any of the models better” but unfortunately I was already breaking into a sprint and fumbling for my car keys. So there you have it, the next time school holidays roll around and the kids complain that they are bored take them down to Mr Two Swords. That should shut the little fuckers up for a while.